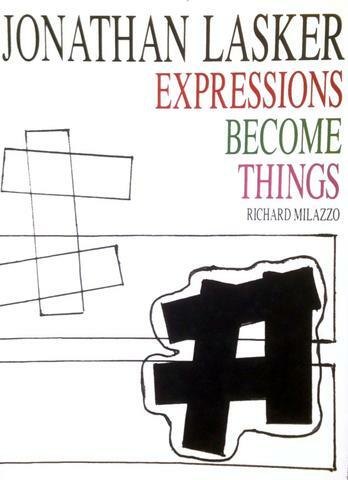 JONATHAN LASKER: EXPRESSIONS BECOME THINGS by Richard Milazzo is the first book to analyze the role of the sketch in the artist’s work. Preliminary even to the small studies, the sketches are the stage in which Lasker works out his initial ideas for a painting. Even before making the study or studies that precede the painting, the artist sketches out the most rudimentary of forms and colors, often making the most radical of changes in the process of arriving at the image that will become the final painting. In observing as we do in this book the evolution of the eleven sketches, we see, as it were, the artist’s mind at work. In his essay, the author also analyzes the distinct relation of the sketches to the single study and their relation to the painting, Expressions Become Things, all executed in 2000. The eleven sketches, the study, and the final painting are all reproduced in color. Reminiscent of the seminal volume, Jonathan Lasker: A Conversation with Collins & Milazzo and 13 Studies for a Painting entitled “Cultural Promiscuity,” published in 1987, which could also be used to understand the artist’s work in general, Richard Milazzo’s JONATHAN LASKER: EXPRESSIONS BECOME THINGS is an instrument created specifically to closely scrutinize not only the working process but the act of conception or origination in a work of art.